BANGI, 19 Dec 2013 – Student leaders or councils of universities should be more mature and more open-minded to face global challenges. Second Finance Minister Datuk Seri Ahmad Husni Hanadzlah said student leaders should develop and implement programs that would ensure the future of the university graduates . He said there would be no direct benefit to the students if the representative bodies are narrow-minded or lack vision. “The year 2020 will arrive soon . Young people need to look at a longer term,” he said. He was speaking at the signing of a Memorandum of Understanding between The National University of Malaysia (UKM) and Yayasan pendidikan Cheras, here today. 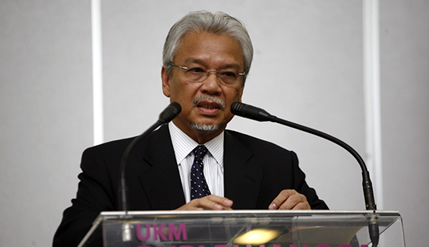 Datuk Seri Ahmad Husni, who is UKM’s Mentor Minister, explained that graduates in this country should be more willing to serve the country rather than pursue selfish ends. For example , he said , Singapore and South Korea are now regarded as more advanced than Malaysia because they have youth conscription programmes which helped them leap-frog into developed nation status. Although Malaysia has no plans for military conscription as Singapore and South Korea do , the country needs to create a program that encourages youth to focus on development . He stressed that youths need more motivation and not be overly dependent on the government for assistance or encouragement. Datuk Seri Ahmad Husni also advise them to equip themselves with the skills of communication, whether oral or in cyberspace. Skills are not limited to Information and Communications Technology . They must be willing to become team players or volunteers . However, he added that traditional subjects such as writing and negotiations are also important for their careers and must also be strengthened.